Easy and creamy homemade ice cream filled with gingerbread spice flavor and pieces of real gingerbread! Prepare a baking sheet with parchment paper. Place cubed gingerbread in a single layer on prepared sheet and place in the freezer for at least an hour. 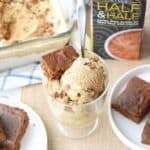 In a large bowl, whisk together heavy cream, Land O Lakes® Buttercream Style Half & Half, brown sugar, and molasses until combined. Add cinnamon, vanilla, ginger, salt, cloves and nutmeg and whisk vigorously to combine. Place bowl in the fridge to chill for at least an hour. Pour batter into frozen ice cream maker and prepare according to manufacturers directions (usually 20-25 minutes of churning). During the last 5 minutes, add in your gingerbread. Store in freezer-safe container and freeze for a couple hours if you want it to be soft-serve texture (or overnight, if you want to eat it after it’s hardened). Enjoy!